Here's great news for everyone! 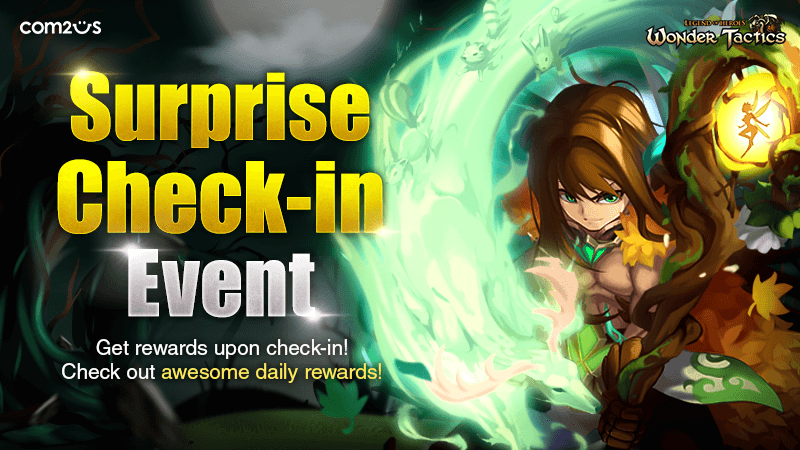 Wonder Tactics will be holding a surprise check-in event. Check in every day to get daily check-in gifts, and get accumulated check-in gifts as well. Also, don't forget to check out burning time schedules that will be added! - Check in every day to get check-in gifts! - Get rewards according to your accumulated no. of check-ins during the event! - Don't worry even if you couldn't check in consecutively, your check-in days will still count. - All event rewards will be sent to the Inbox. - 2x Gold/2x EXP will only apply in Normal Dungeons and Secret Dungeons. - The time of the Gold/EXP Boosters that is in use during the event will be extended by the time spent for the event.